The fiber optic sensor system. Professor Balakumar Balachandran (ME), Assistant Professor Miao Yu (ME/ISR), and Research Associate Moustafa Al-Bassyiouni (ME) were awarded U.S. Patent No. 7,224,465 on May 29 for "Fiber Tip Based Sensor System for Measurements of Pressure Gradient, Air Particle Velocity and Acoustic Intensity." The invention is a fiber optic sensor system for pressure measurements where the design permits multiplexity on the input side of the system and the optical part of the system, which has a sensor Fabry-Perot interferometer and a read-out interferometer, and is based on low coherence fiber-optic interferometry techniques. This permits a high dynamic range and low sensitivity to the wavelength fluctuation of the light source as well as to the optical intensity fluctuations. The system includes fiber tip based Fabry-Perot sensors, where each sensor includes a diaphragm as the transducer. A combined pressure gradient sensor, air particle velocity sensor, as well as acoustic intensity sensor is built based on the fiber tip based Fabry-Perot sensors. 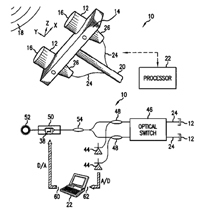 The patent has been assigned to the University of Maryland. View ISR patents online at any time at the ISR patents page.